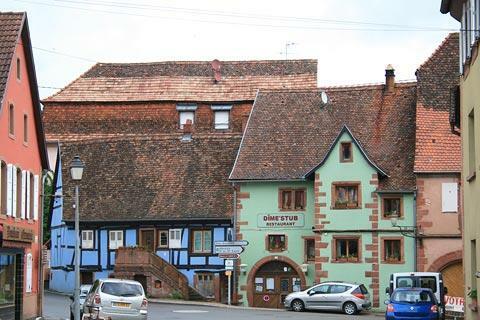 Neuwiller-les-Saverne is a village to the north of Saverne in the Bas-Rhin department of the Alsace region. Neuwiller-les-Saverne is quite a large village but even so it is surprising to find not one but two large churches here dominating the centre. 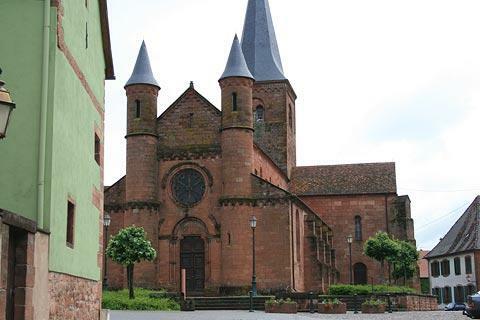 It is the Abbey-Church of Saint-Pierre and Saint-Paul that is the highlight of a visit to Neuwiller-les-Saverne, and is an interesting ensemble of architectural styles from the Roman to the Baroque. The church dates from the 9th century with further additions made until the 18th century, and is one of the most impressive churches in the Bas-Rhin department. On the outside of the church, note in particular the ornately decorated entrances which are the oldest part of the church. The main facade is more recent, having been added in the 18th century. Inside the church there are also some very interesting features such as a 12th century baptism font, some 15th century tapestries that relate events from the life of Saint-Adelphe, and painted wooden sculptures. The Church of Saint-Adelphe was built between 1190 and 1230, and is an unusual design with two thin round towers forming part of the facade. The church was built to cope with the number of pilgrims who were visiting the chapel that previously stood here and held the remains of Saint Adelphe. It is possible to stand in the middle of the village and turn in one direction to take a picture of the Abbey Church of Saint Pierre and Paul and turn in the other direction and take a picture of the Church of Saint Adelphe. 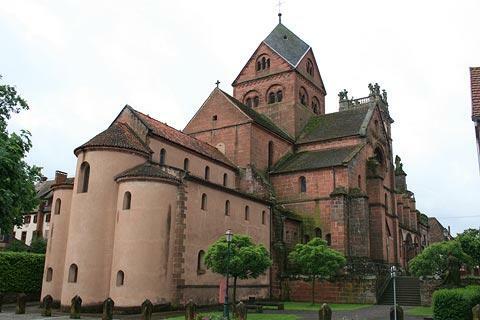 As well as the churches in Neuwiller-les-Saverne you can also see the remains of a fortified wall around the town with some interesting ancient inscriptions, and one of the original watchtowers. 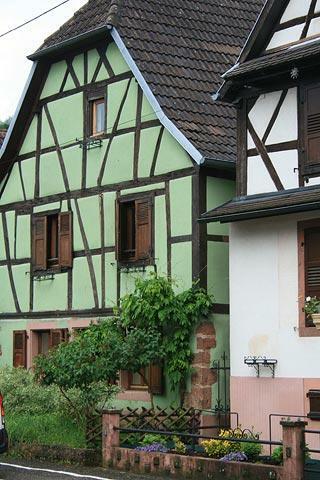 As with many Alsatian villages there are a number of pretty half-timbered houses scattered throughout the village. You can also see and an 18th century fountain as well as some grander townhouses* and more recent additions such as the 18th century Town Hall. * Among the most interesting older houses are the Maison de Patriciens on Impasse Léopold and the 16th century Maison de Chanoine at 1 rue du Général-Koenig as well as the 13th century Salle Capitulaire. The remains of the Chateau de Herrenstein can be visited in the woods above Neuwiller-les-Saverne. Constructed originally in the 11th century, the castle was converted into a fortress in the 16th century. It is now in ruins. The nearby church at Petit-Pierre has some 15th century frescoes, and also nearby is the Chateau de la Petit-Pierre, now the headquarters for the Regional Natural Park of North Vosges.